A radar sensor is fitted to the front bumper to monitor the traffic situation . Vehicles travelling ahead can thus be detected up to a distance of approximately 120 m.
The efficacy of the radar sensor can be impaired by contamination such as slush or snow, or by environmental conditions such as heavy rain or spray. This means that the Adaptive Cruise Control (ACC) also will not work. The instrument cluster display shows the message ACC: no sensor view!. Clean the radar sensors as required . The ACC is automatically available again as soon as the radar sensor is no longer impaired. The message in the instrument cluster display goes out, and the ACC can be reactivated. Strong reflected radiation of the radar signal, e.g. in multi-storey car parks, or when near metallic objects such as rails in the road or metal plates used in roadworks, can impair the function of the ACC. The area in front of and around the radar sensor must not be covered by objects such as stickers or auxiliary headlights, as this can impair the function of the ACC. Any structural modifications to the vehicle, e.g. lowering the vehicle or making alterations to the front end trim, can impair the function of the ACC. Structural modifications should therefore only be carried out by a qualified workshop. Volkswagen recommends using a Volkswagen dealership for this purpose. 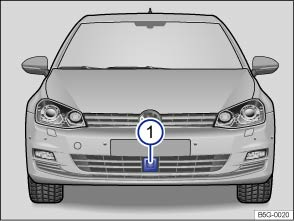 Incorrectly performed repairs to the front end of the vehicle can alter the position of the radar sensor and therefore impair the function of the ACC. Repair work should therefore only be carried out by a qualified workshop. Volkswagen recommends using a Volkswagen dealership for this purpose. Switch off the ACC if you suspect that the radar sensor has been damaged or its position has been altered. This can help to prevent further damage. Have the radar sensor realigned. The radar sensor could be moved if it is hit, for example in parking manoeuvres. Readjusting the sensor could impair the performance of the system or cause it to be switched off. Repair work on the radar sensor will require special knowledge and tools. Volkswagen recommends using a Volkswagen dealership for this purpose. Remove snow with a brush, and remove ice preferably with a solvent-free de-icer spray.